This example demonstrates that the Symbolic Math Toolbox helps minimize errors when solving a nonlinear system of equations. The goal is to find the minimum of the Rosenbrock function, or the so-called "banana" function. Translate the equations for the Rosenbrock function and Jacobian from the math form in the text to numeric code. Explicitly calculate the Jacobian. For complicated equations, this task is prone to errors. This example shows that using symbolic math to describe the problem statement and subsequent steps minimizes or even eliminates such errors. 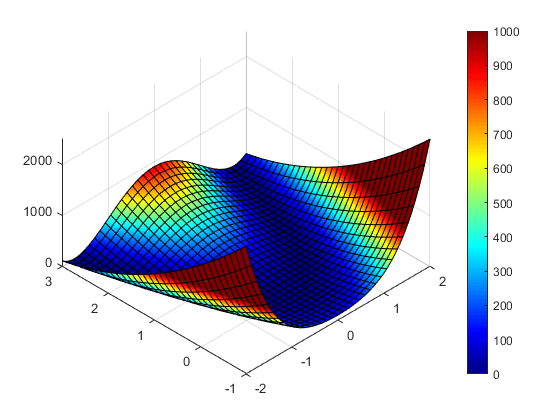 First, convert the Rosenbrock function f to a system of nonlinear equations F, where F is a gradient of f .
To match the intermediate results shown in the Optimization Toolbox example, use the same form of F.
Use jacobian to calculate the Jacobian of F . This function calculates the Jacobian symbolically, thus avoiding errors associated with numerical approximations of derivatives. Show the first 10 rows and columns of the Jacobian matrix. Most of the elements of the Jacobian matrix JF are zeros. Nevertheless, when you convert this matrix to a MATLAB function, the result is a dense numeric matrix. Often, operations on sparse matrices are more efficient than the same operations on dense matrices. Therefore, to create efficient code, convert only the nonzero elements of JF to a symbolic vector before invoking matlabFunction. is and js represent the sparsity pattern of JF. The system of equations F, representing the Rosenbrock function, is a symbolic matrix that consists of symbolic expressions. To be able to solve it with the fsolve function, convert this system to a MATLAB function. At this step, it is convenient to convert both F and its Jacobian, JF, to a single file-based MATLAB function, FJFfun. In principle, this allows F and JF to reuse variables. Alternatively, you can convert them to individual MATLAB functions. FJFfun accepts variables as a list, but fsolve expects a vector of variables. The function genericObj converts the vector to a list. Anonymous function bananaObj is defined to fix argument values for genericObj. Note the use of the sparsity pattern in the function genericObj. Further note that this approach of using FJFfun and genericObj together is not tied to the particular expression represented by F and can be used as is for any F.
Use fsolve for the system of equations, converted to MATLAB function. Use the starting point x(i) = –1.9 for the odd indices, and x(i) = 2 for the even indices. Set 'Display' to'iter' to see the solver's progress. Set 'Jacobian' to 'on' to use the Jacobian defined in bananaobj. 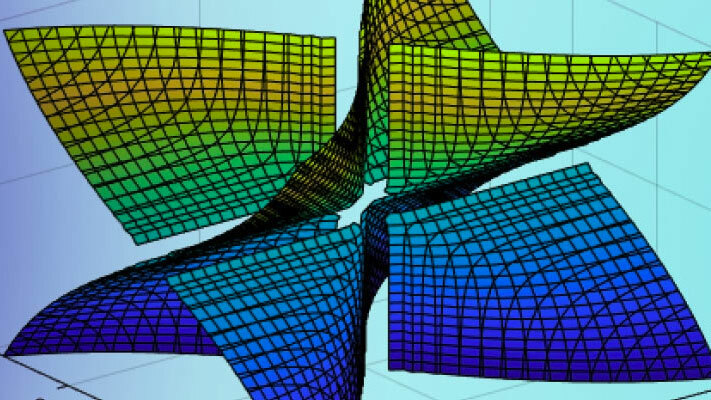 The system of nonlinear equations, F, can be alternatively solved with the vpasolve function, which is a numeric solver available in Symbolic Math Toolbox. A key difference between vpasolve and fsolve is that fsolve uses double-precision arithmetic to solve the equations, whereas vpasolve uses variable-precision arithmetic and therefore, lets you control the accuracy of computations. Copyright © 2016 The MathWorks, Inc.